Got Resolutions? (Apologies if you are one of the 8% who make and keep your resolutions). Why do we repeat a ritual that begins in anticipation and optimism only to dribble into disappointment after awhile? Perhaps because it feels so good to imagine dropping the excesses and experience ourselves newly reborn as the lean, disciplined, healthy selves we feel in our hearts we are meant to be. Perhaps it’s because we long to believe in the possibility of TOTAL TRANSFORMATION. The poet Rumi tells us “Half of any person is wrong and weak and off the beaten path. Half! The other half is dancing and swimming and flying in the invisible joy.” At Partners in Resilience we recommend recognizing and strengthening the half that is dancing in the light instead of trying to amputate the part that is off the path. What does this mean in practical terms? First, you might recognize and celebrate the fact that you always wish to live a life that reflects your highest desires for health, joy, energy, mastery and self-love. The fact that you don’t live that vision 24/7 means that you’re human, not that you’re a loser. You can choose to notice where and when you are already acting from that wish. In every decision you make that reflects self-restraint, i.e. passing on the second piece of bread, not honking at the guy who cuts in front of you, spending money on someone else rather than yourself, choosing organic over genetically modified foods, you support the parts that are dancing in the invisible joy. It often happens that we feel more urgency than we need to. An urgent sense feels like I’ve got fix this yesterday. It’s a bit like planting the seeds before we’ve prepared the ground to receive them. We recommend preparing the ground for change by beginning with a period of noticing the change that is already present. We suggest keeping a journal for up to 30 days, where you write down what you are already doing that supports your change vision. When you do this, you send yourself a message that essentially says, stop, breathe, be calm. This helps you connect with your Inner Visionary—that part of you that knows you deeply and imagines who you can become. It sidesteps your Inner Critic who reminds you of all the ways you are off the path. It tells your fight-flight system THIS IS NOT AN EMERGENCY. 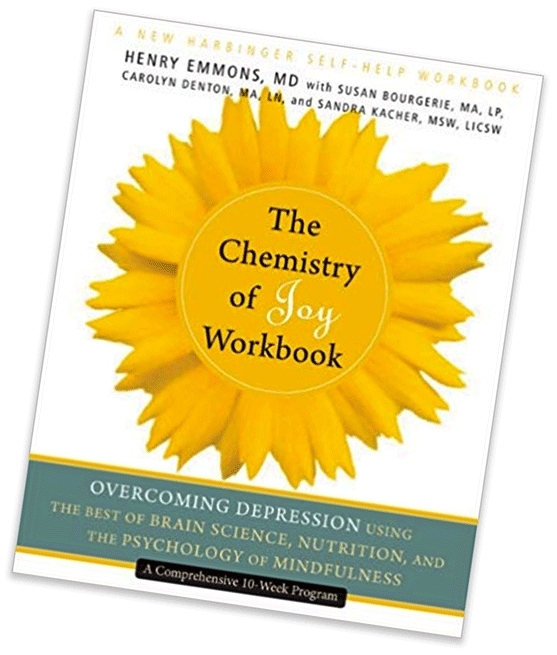 In our book, The Chemistry of Joy Workbook, we talk about change as a whole person process, not a top-down endeavor. No doubt you’re familiar with the top-down approach. This is where the Inner Critic reminds you of the variety of ways you are inadequate and falling short. Because the Critics live in black and white worlds, they see no problem with setting rigid goals that must be pursued perfectly and performed without fail. (Starting tomorrow, I will go gluten free and never allow a morsel of wheat to pass my lips. Starting tomorrow I will keep track of everything I buy and will never spend another penny impulsively. Starting tomorrow, I’m not going to be selfish anymore.) In their efforts to help us change, the Critics doom us to fail. Change begins with awareness of suffering. This means you need to feel the pain of your present choices. This might be something like mindfully experiencing what it feels like the morning after you’ve overindulged in something. Do you feel sick? Are you irritable, embarrassed or ashamed? Let yourself really feel how distressing these experiences are. The wonderful thing is that true awareness of suffering—our own or others—calls up a compassionate response. Let compassion be your motivator. Consider body, mind and heart. Maybe your behavior causes physical discomfort or pain, maybe it leads to worry, suspiciousness and paranoia, or maybe it cuts you off from those you care about. Out of compassion for your body, mind and heart, ask yourself what would bring relief? Let the energy of compassion and desire for relief of suffering lead you to wise action. The change path is convoluted, curvaceous and meandering. Just as the Critic prefers black and white and all or nothing, it believes strongly in straight lines with no missteps. The Critic sees setbacks as failures, forbids do-overs, and thinks hopelessness is a good motivator. Sorry, Critics, the dance of change is not a line dance, it is free form and improvisational. What would a change plan look like that includes these factors? It would include the Body. Begin where there is suffering: Get a body sense of the distress that you experience when you make self-harming choices. Allow yourself to be with those sensations for a few minutes several times over a few days. Try to welcome this as useful information. Use as many of your senses as you can to imagine yourself successfully incorporating the change behavior. Connect with the body sensations that accompany the images of change. Savor them; call them up as frequently as you can. It would include the Mind. Keep a journal for a week or longer of times you are already doing something that contributes to the changes. Affirm yourself for these thoughts and actions. They really do count and they challenge the all or nothing thinking of the Critic. Identify the easiest next step that you can incorporate into your life. Do it for ten days, then identify the next step. If this seems too slow, go ahead and take more and larger steps, but remember that each time you take the easy step, you are succeeding. It would include the Heart. Create a support alliance. Share your desires, share your experiences. If you are more likely to do things with others, share the change activities. Isolation is a friend of failure; connection is its antidote. As Suzuki Roshi famously said, “You are perfect as you are—and you can use some improvement.” Those who succeed at change recognize that we are always on a change path and always starting anew. We are always starting in the middle.